It’s easy to find gloves for little hands, but most of them are 100% cotton. To ensure a secure grip, select cotton gloves that have palms dipped in rubber. While baseball hats for children are common, beach-style hats with wide brims provide better sun protection. Better still are hats made with fabric that has substantial sun screening properties, such as UPF 50+ fabric to protect kids from the harmful effects of the sun. Children’s sunscreen is a no brainer when it comes to little ones and outdoor activities. Read the labels carefully and follow the instructions to achieve the most effective protection. Older gardeners will benefit from hand tools, rakes and hoes that are scaled-down versions of the real things. Tykes will enjoy lightweight but less enduring plastic versions. In either case, the kiddos should be supervised, of course. Child-sized scissors with safety-edge blades and blunt tips are perfect for deadheading plants or snipping a few blooms or herbs, with some adult guidance. Buckets not only serve a variety of purposes in the garden, they are a good place to stash gloves and hand tools in the interim. Many come in bright colors or are branded with favorite characters. Some themed gift sets can be big hits with the little ones, too. Even kid-sized wheelbarrows can be tippy and frustrating to maneuver. Heavy-duty plastic versions of the time honored red wagon are a good option for collecting and moving garden items. Lots of child-size watering cans are available. Plastic versions won’t dent and are lighter for little ones to use. These are one of several opportunities for crafting with little ones. For those old enough to read and write, stamp or write plant names onto light colored bricks or flat stones. Or laminate seed envelopes or photos of the plants and affix them to a stake for easy recognition of what is planted where. There are lots of mini-garden kits available for children. Many come with bulbs or seeds, appealing containers and whimsical figurines and other decorations to add. Some use larger versions of test tubes to display root systems. Try buying or making egg carton gardens. Terrariums are also easy and popular alternatives. Kits to create stepping stones are one of the easiest ways for kids to make garden art. Handmade garden stepping stones are practical and useful. Add names, dates and handprints to amp up the sentimental factor. And then there are paint-your-own garden art kits. They include figurines made of composite materials and paints. Make sure the paints are waterproof and to paint the objects outside. Garden-related books for children abound. Some have connections to beloved authors, including Beatrix Potter and authors who write for Dr. Seuss characters. Others are typical children’s storytelling books about gardens. And then there are the books detailing garden-related projects for kids. Pint-sized gear can be the perfect tools to help the children in your life develop a curiosity about and interest in the garden. 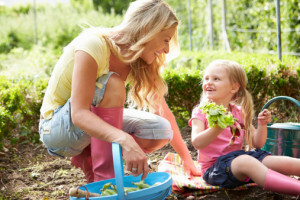 But spending time with them in your garden and sharing your passion for growing plants and vegetables is the true foundation for cultivating a youngster’s interest in gardening. Creative Commons Attribution: Permission is granted to repost this article in its entirety with credit to Hydro Mousse® Liquid Lawn® and a clickable link back to this page.